This professionally shot scene includes 2 beer bottles leaning in front of a stained stairway. The stairs are covered with barley hop seeds representing the dark & tan beer product being showcased within the 2 bottles. The bottles themselves are dripping with water droplets due to condensation as the cold brews sit in the warm air! 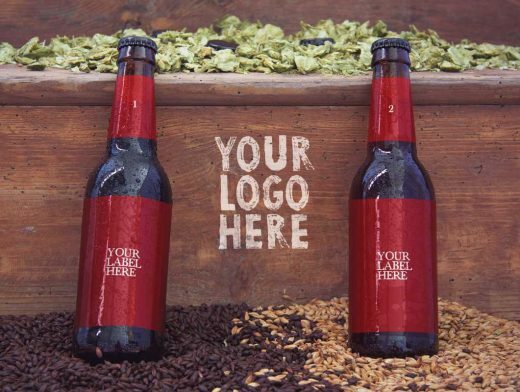 This Photoshop template comes with all the Smart Objects you will need to instantly add your beer branding to the bottles and your corporate logo to the staircase backstop on which the bottles lean up on.